Ernest Wilhelm Peters was born in Stettin in East Germany, now Szczecin in Poland. He arrived in the UK as a prisoner of war in 1946 from Belgium and worked on farms in Hertfordshire until his discharge. Unable to return to his place of birth, he decided to settle in England and to marry. He trained as a nurse in General and Psychiatric Nursing, enjoying a long and satisfying career before retiring as a Divisional Nursing Officer. Retired with his wife to Devon, he graduated from the Classics Department of Exeter University with a BA (Hon). 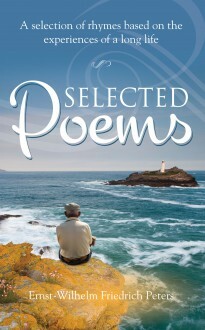 Ernest has been writing poetry since childhood, and now hopes to give some enjoyment to those who read this selection of rhymes based on the experiences of his long life.